That was a question we all had in our heads when we received the email invitation. Went for a floral blazer over white bottoms for a Spring florals look! My lovely companion for the evening; Melissa Jane and her OOTD! The gorgeous poolside of Mariott Hotel! Doesn't the pool and all the lounge chairs look so inviting?? Can I please stay here?!?! It really rained shortly after. So pretty that we can't resist taking pics by the poolside! And the presentation on what INFLUR was began! INFLUR is actually a site for anybody who has a blog or any one who creates "content". It uses an algorithm to determine the level of influence you have and you get to progress from there. They basically work to reward content creators via the different levels of influence and tiers of influencers. Being a content creator just got more rewarding cos once you progress to the "Elite Influencer" tier, you get selected to represent various brands or even get exclusive invites to their events! You will also get rewarded in terms of cash rewards or other forms of tangible rewards. So put your creativity to good use by joining INFLUR today! Light refreshments at the event included canapés and macarons. Other presentation for the night included one from their partners, Laneige! The introduction to the BB Cushion from Laneige! Though I've wanted to try out BB cushion, there are simply so many around so it's pretty hard for me to actually just choose one. Anyway, today's introduction was about their BB Cushion! Who loves Song Hae Kyo? I think she's one of the most gorgeous looking Korean actresses ever! She's the spokesperson for Laneige and you just can't take your eyes off her! Worried that it may not suit your skin tone? There are 4 shades to choose from to ensure you get the closest match to you skin tone! Why is this BB Cushion reccommended? 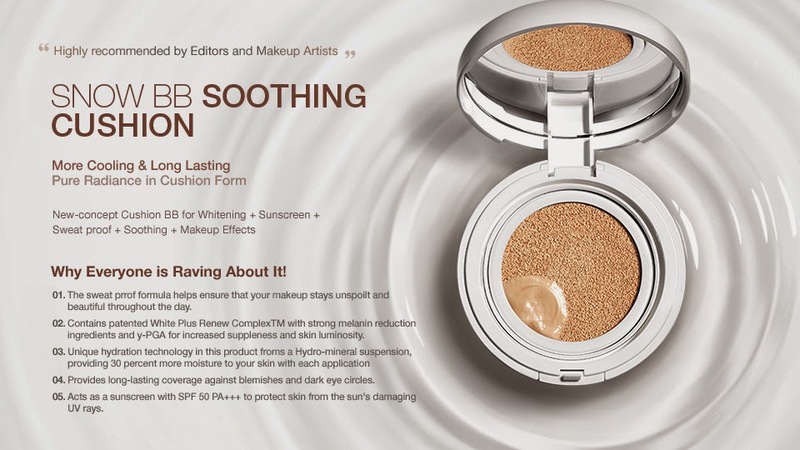 This BB Cushion from Laneige has got these unique ingredients that will actually "digest" melanin and a whole of of other toxins, waste and impurities that are the main causes of yellowish/sallow skin. It has a unique hydration technology that utilizes a hydro-mineral suspension through their Optimal Mineral Water to provide deep and long lasting hydration to our skin! Can you imagine that you're out in a super hot and sunny day and you feel parched, your skin feels heated up and all you have to do is to apply this BB cushion and it will cool and soothe your skin? I can't wait to try this product out! You know, oily T-zone, rather dry on the sides of the face. My problem was really the edges of my mouth where the "smile creases" are. They tend to get really dry and will even start to peel in the middle of the day despite putting on a hydrating moisturizer and serum before makeup! I'd apply the water sleeping pack to bed and the next morning? No more dryness, only hydrated skin! After the event, we stayed around to mingle before heading for dinner at Popeye's! With bloggers Naomi Liu, Agri Velt, Jenny and Melissa. 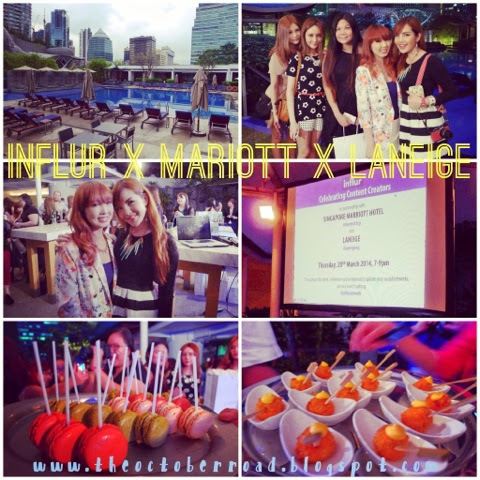 Thank you for the the invitation to this INFLUR Launch event at the iconic Marriott Hotel on Orchard Road!